Today marks a significant shift in our company’s trajectory; away from the blog-centric, jack-of-all-trades productivity platform to a focused, professional training company that leverages faith and peak performance science to help individuals and teams live the best version of themselves: spiritually, physically, and socially. This shift is the result of months of strategizing, brainstorming, and soul-searching into how best to position our company, not just for the next 10 years, but for many generations to come insha’Allah. With this shift, we had to make some tough decisions. Perhaps, the toughest of them all is saying goodbye to our beloved orange stickman figure, Abu Productive. In 2008, when ProductiveMuslim.com started getting traction, a young graphics designer reached out to me and asked if he could do a logo for ProductiveMuslim.com. Not sure what to expect, I said yes and eagerly waited for the promised logo. When he sent me the logo which included a black and white stick figure, I realized instantly that a character was born who will play a central role in how we communicate and reach out to our audience. Even a couple of years later, when I was looking for a logo refresh, and I hired a professional graphics designing company, we couldn’t think of a better logo than updating the stickman from a 2D black and white figure to a 3D orange stickman figure. During the early years, our stick figure was not called Abu Productive, we just referred to him as “Productive Muslim.” It wasn’t until a friend of mine jokingly referred to me as “Abu Productive” that it clicked, and we registered the domain name and social media profiles for our orange stickman, and Abu Productive became the official mascot for ProductiveMuslim.com. Being a cartoon lover myself, I always wanted Abu Productive to come alive through animations. And I was ecstatic when I spoke to the highly talented Animator, Qaed Mai, who agreed to work with me to produce an animated cartoon series based on our mascot. Little did I know how much these cartoons would make an impact in the Muslim world. I’ve heard stories of people starting to pray when they watched Abu Productive’s battery charge up when he prayed. Parents were telling me how much their kids love watching Productive Muslim cartoons over and over again (even more than scooby doo!). Even Mufti-Menk in front of thousands of people mentioned our famous Abu Productive cartoons. To date, the cartoons were viewed over 7 million times on our channel alone (and millions more on other channels) and they are currently playing in homes, mosques, schools, and TV channels across the world. So why are we changing? Believe it or not, we were the victim of our own success. Having such an iconic character on our blog, made it hard for people to recognize the value of our content in their professional adult life. Many people thought that ProductiveMuslim.com is actually a blog targeting students and kids, and this had many implications regarding our business model and how we wanted to position our company. 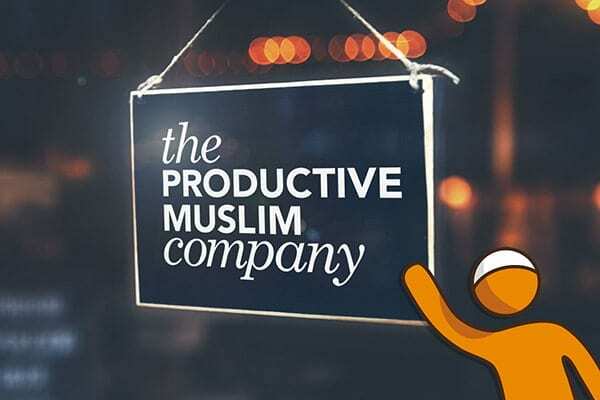 Our vision has always been to boost productivity in the Ummah, and we felt that because we are perceived as a “childish/cartoonish” brand, we are not able to compete with some of the big names in the personal development/productivity space. 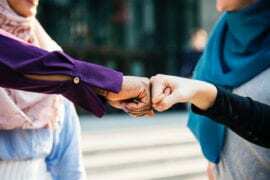 We believe that our coaching and training programs are at the level of top personal development training companies globally (if not better) and we wanted to signal this value to our customers and readers. We want to become a real, professional, faith-based alternative to all the personal development training that’s offered in the world today. And we want to showcase to the world the relevance and beauty of our faith in helping individuals and teams live the best version of themselves. Hence, The Productive Muslim Company. When we were thinking about rebranding and re-positioning ourselves, we had a number of options including changing our name completely to something else. However, we realized that “Productive Muslim” has become a powerful brand and still communicates to our primary target audience. What we wanted to do was enhance the brand name slightly so it rings more professionally, hence we added “The” and “Company” to the name. For the past several months, we’ve been using our new name and logo in our email newsletters, promotions campaigns, and product launches. We were happy with the overwhelmingly positive response to the new name and positioning and it encouraged us to buckle down and do the hard task of rebranding the actual website. 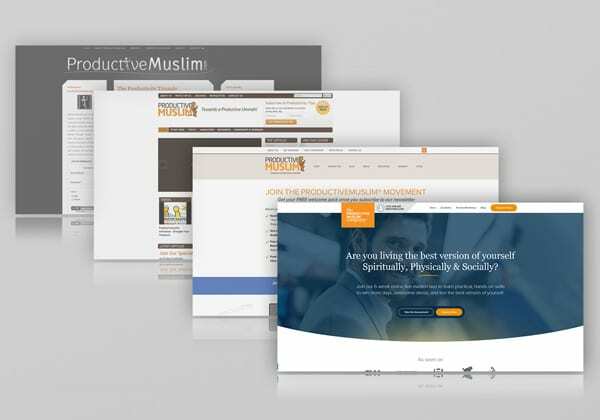 “Our approach to rebranding and designing the online experience for ProductiveMuslim was to show how it has evolved into a market-leading brand recognized by Muslims throughout the world. The design strategy focused on avoiding flat aesthetic and strike a balance between a professional yet personal design language. Since Productive Muslim is about transforming people, we employed a human-centric design philosophy that made sure customers and clients always felt at home and welcomed. The new brand direction now places Productive Muslim in a position to offer far more than ever before; helping to leverage peoples natural ability and faith to become the best versions of themselves” Ruh Al-Alam & Na’eem Mahmood. Any branding expert will tell you that a brand is not just a new logo or website, but a brand is an experience you create in your customers’ minds and hearts. For the last 10 years, we were honored to create a joyful and colorful experience for our readers (young and old) with our iconic Abu Productive character and the ProductiveMuslim.com blog. Today, with our new brand, we hope to create an unmatched transformational experience for individuals and teams who are serious about living the best version of themselves (Muslims and non-Muslims) according to values embedded in our faith and the latest peak performance research. Our goal is that the next time you are contemplating attending a personal development retreat, or signing up for a personal development course, or hiring a personal development coach, you’ll think of us first. So is Abu Productive really gone :( ? 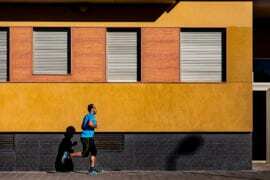 Here’s the good news: Abu Productive is not going to disappear completely. He’ll be back! Most probably in our upcoming children/educational division for our company – after all, we still want to help our upcoming generation to live the best versions of themselves too ;).